Shoulders Shoulder Guards Silvery Scale shoulder guards stretch across both shoulders with a golden tinted edging. 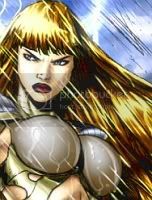 Torso Scale Breastplate A gray breatplate stretches across the expanse of her ample chest, buckled on with leather with thin sheets of golden tinted metal across them. Arms Armbands Ornate armbands stretch around each bicep, tinted golden and stretching down from beneath the shoulder guards they are more for ornamental use than anything else. Hands Bracers Bracers of the same material and ornate design as her armbands stretch down over her wrists. Waist Belt A leather belt plated on the outside with thin gold tinted metal. Feet Boots Silvery boots outlined with the pale golden hue, from the top of the boots you can see the thin brown leather which lies beneath the plates. Pack Backpack A simple brown backpack that can be strapped onto her back. Alesca was born in a small town just on the edge of Avalon. Her mother had died when she was thirteen and her father had taken up the drink as a way to console himself from her loss. He had wanted all boys and when it so happened that his second child was female, he practically shunned her from his life. She grew up a tomboy, ever attached to her older brother who died when she was sixteen. He taught her much about fighting before his passing and distraught with the death of his son, her father came after her in a drunken rage. Much to his surprise, the young girl fought him off with a fury that frightened him and it was then that he'd arranged for her to learn the Fighter's trade, determined to give her a focus with which to direct her wild temper and stubbornness. She took up the trade well and seeking to leave the small town and the will of her father, Alesca traveled as a caravan guard to Avalon.